Lice treatment doesn't work on 'mutated super lice'. 'Mutated super lice' have invaded our kids' heads and they are resistant to over the counter remedies. Just the thought of them makes you itch. Just the sight of them makes you squirm. The wriggly little bodies. The sucky little fangs. They are crawly and creepy and ready to feed upon your baby. And coming to a head near you is the new SUPER MUTANT version. 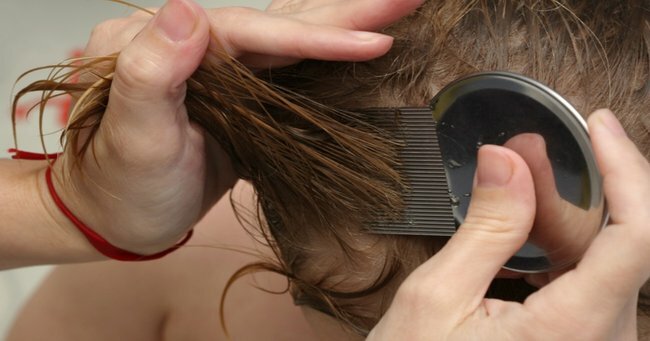 A new treatment resistant mutated species of "super lice" that cannot be killed by even the most popular over-the-counter remedies have arrived and researchers say that getting rid of them is going to be harder and harder for parents. A study published recently in the Journal of Medical Entomology, has found that common over-the-counter insecticides such as permethrin used to be up to 100 per cent effective in killing the parasites when it was introduced in 1984. Listen to Holly Wainwright and Andrew Daddo talk about their most embarrassing head lice moments on Mamamia&apos;s family podcast, This Glorious Mess. Post continues after gallery. But now researchers have found 98.3 per cent of the lice have a mutation meaning the lotions and sprays and shampoos are about as effective as kyrptonite on Lex Luther. And they&apos;ve found, these super mutant lice are planning on taking over the world. Well, our children&apos;s scalps at least. Super mutant lice have arrived. Image via IStock. Head lice those small, wingless parasitic insects that live on human heads draw blood from the scalp and cling to hair have proved near impossible to remove at times. They crawl and jump between heads laying eggs to re-infest and re-infest and re-infest. Researchers found that the type of treatment you’ve probably traditionally raced out to the chemist for (while trying not to retch) are now almost 100 per cent ineffective. You could just about weep over that couldn&apos;t you? Watch: Back to school advice for kids with nits. Post continues after video. They found that the lice have developed a widespread "knockdown resistance" mutation, which can be passed on through generations..
“Resistance levels were not decreasing with time," the study said. "This finding is expected, as the OTC [over-the-counter] products containing the pyrethrins or pyrethroids are still being used." A close up of a human head with an infestation of parasitic nits or eggs hatching near the scalp. Via IStock. Dr Cameron Webb, a medical entomologist at the University of Sydney, told Fairfax Media it was well known that when insecticides were used for a long period, they would decline in effectiveness. "It&apos;s not surprising at all, because we know that insect pests of agriculture or public health concern, when we have a reliance on pesticides to control them, there&apos;s always a chance they will develop a resistance," he said. "We know it&apos;s happening with mosquitoes, we know it&apos;s happening in bedbugs, and it&apos;s no surprise at all that it would be happening in head lice." "It&apos;s no surprise at all that it would be happening in head lice". Image via IStock. Experts say the best method to treat these SUPER MUTANT nits is by the old fashioned method of cheap conditioner and a comb (oh and an iPad to keep those wriggly little bodies still for a good half hour or so while you try and comb the nits out). You have to be consistent they say and repeat the whole awful procedure a few days later to get the pesky little ones who’ve hatched intent on re-infesting the home. NSW Health advise that bed linen, hats, clothing and furniture do not harbour or transmit lice or nits and that there is no benefit in washing them. Alternatively we could just give up and let the SUPER MUTANT LICE take over the world.